Inspired by a windmill that straddles the land west of my studio windows, I've watched, for the past six years, as birds of many kinds perch on the metal structure. Of course, they only do so when it's not turning, which is frequently after the sun drops and the winds do the same. Doves, hawks, sparrows, starlings, robins, jays, flickers, bluebirds, and others have all congregated atop the vanes and on the metal brace around the legs of the windmill. 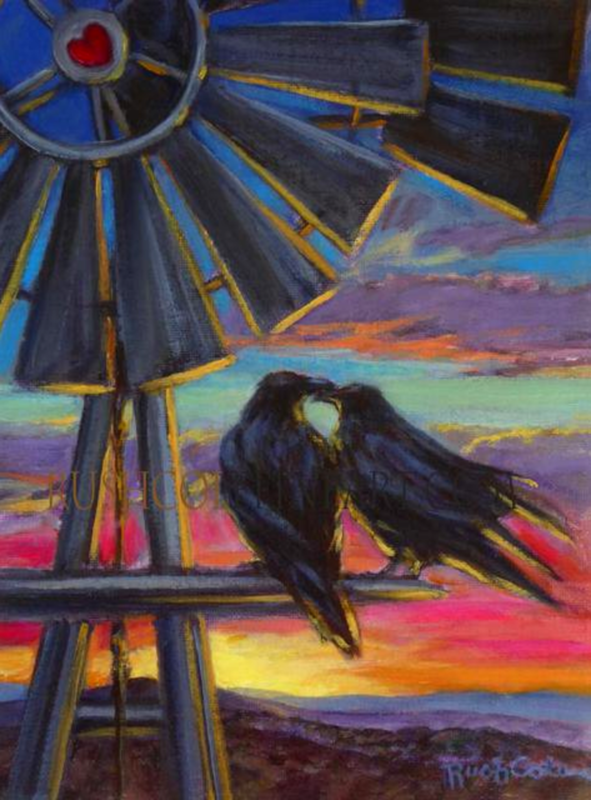 The ravens are the ones that captured both my imagination, and my heart, though, as pairs of them lit on the perch at sunset and tenderly "kissed" in the day's last burst of fiery colors. There will be some who view this artwork and believe that it is one that came from my imagination. Not so...all I did was document it in paint on canvas.